Right front (southeast) corner of the Pico Cottage (aka Big House). Note the carriage step directly behind both horses' front legs. 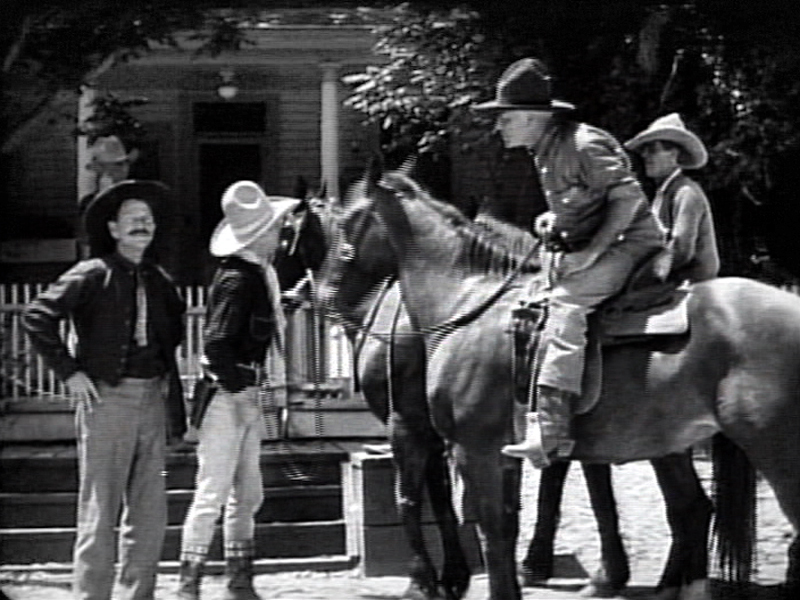 Screenshot from "The Last Roundup" (1929), filmed primarily in Pico Canyon/Mentryville. Between them, producer Trem Carr and director J.P. McGowan were responsible for many of the movies shot in the Santa Clarita Valley in the 1920s and 1930s, particularly in Placerita Canyon. They probably didn't realize  or care  that they were recording our valley's history along the way. It's a good thing they did. Carr and McGowan unwittingly documented 1929 Newhall in their Bob Custer film, "Code of the West"; in another one of their 1929 Custer vehicles, "The Last Roundup," they give us views of Mentryville and details of its buildings that we haven't seen elsewhere  such as the rear entry to the community (dance) hall, which no longer exists; side doors to the barn (heard of, never seen); an "expansion" of the chicken house (who knew? ); a carriage step at the main house; fences, vegetation and more. Carr and McGowan also leave us with a sense for the proxmity of the structures, and because we know the film was released in July 1929, when know when Mentryville looked this way. I've done a fair amount of wranglin' in my days  moving a few cows around Pico Canyon, and once even wranglin' some sheep. Cats are the worst critters to wrangle. People are worse. Suckin' dust on the south end of a northbound trail ride of teenagers is about the worst wrangling job I ever had the misfortune of having. Until I saw what may be the worst wranglin' job ever: rattlesnake wrangler. It looks like a very skillful job that I want to be as far away from as I can get. But there he was on a little filming set the other day between the Pico Cottage and the Felton School. Eight folks standing around the wrangler as he was trying to coax the snake to bite a cowboy boot. Don't know the film company or what it was all about. There were some other stunt actors there who had spent some time rolling off of the porch roof and the roof of the chicken house onto some really neat air mats. I, too, rolled off those roofs, only I didn't have the mats. It may explain why I spent all those years in and around submarines  but that is a whole new story. It is going to be good to see the Pico Cottage or "Big House" in another movie. The chicken house will be in a movie again, too. But these are not scenes new to cinematic history. Just the other day I watched a 1929 silent three-reel Western called "The Last Roundup." It was mostly filmed in Mentryville. Do any of you remember the stars of "The Last Roundup"? Bob Custer was the hero. Hazel Mills was the schoolmarm, or teacher. There was an actor named Cliff Lyons, too, but no relation to Lyons Avenue. Their name was Lyon. Anyway, it is a great little flick about a ranch foreman who has to save the schoolmarm and catch the cattle rustlers and arsonists. Yep, the movie even has the wonderful Southern California event, the brush fire. One scene must have been a very large fire filmed someplace and put in the film. It looks like the fire may have been in the Hollywood Hills. I can't really tell. Scenes filmed in the movie include some details of the buildings that I hadn't known before  little details that folks have wondered about for a long time. Now, since it is not a movie in color, we don't know what color the buildings were painted at the time. They all look to be the same. I can state here and now that the barn and school were not red. It is in those little details that I had to concede I was wrong about the fence in front of the cottage. I said for years that it was a two-board fence painted white. Well … it turns out it was a white picket fence, as has been (re)constructed in the past few years. It also shows the eucalyptus trees growing in front of the house and around the Felton School. They appear to be pretty mature trees, about 30 years old. One scene has the hero and the schoolmarm in front of the barn. They kiss. (I got a kiss there once.) But it also has a view of the suspected doors that opened to the coral to allow access to the milking area. We had heard of those doors, but by the 1960's when I lived there, they had been replaced with the siding you now see. These details might mean little to many, but they are important to folks who want to know about them. At least both of us do. There are a couple of great views of Felton School. Both sides. Little details like the woven lattice screens that block the view of the interior of the boys restroom or outhouse. In that same frame of film we can see a column supporting part of the long-gone community center building. I didn't know about that detail before I saw this flick. There are also some shots of the chicken house that show a "lean-to" roof off the side. Never knew about that, either. The Santa Clarita Valley is unique in that while we may lack a concise, written history of many parts of the valley, we have films that show huge chunks of it. Many of us argue about that history only to find that what we thought and what we had been told is not what these old movies show. We know for sure that filming has been going on in our valley since 1910. I'm looking for an old Tom Mix movie filmed in Mentryville in 1927 named "Outlaws of Red River." Anyone have a copy? "The Last Roundup" has several scenes outside of Mentryville. Beale's Cut, Placerita Canyon, and some places that today defy efforts to identify them. One place may be the Walker Cabin in Placerita. Can't tell. So the next installment will be about the rest of the movie. I will write a little about Towsley Canyon  how it ties into Mentryville and Pico and how it is today. I may dabble a little in local politics again. Stand by for next week. I can tell you one thing I won't be doing until then: wranglin' rattlers! Darryl Manzer grew up in the Pico Canyon oil town of Mentryville in the 1960s and attended Hart High School. After a career in the U.S. Navy he returned to live in the Santa Clarita Valley. He can be reached at dmanzer@scvhistory.com and his commentaries, published Sundays on SCVNews.com, are archived at DManzer.com. Watch his walking tour of Mentryville here. Further reading: The Story of Mentryville.